The introduction of VAT will significantly change business accounting operations. This guide explains the basics of VAT and it’s impact on businesses and consumers. Why is the VAT being introduced? A direct tax is paid directly to the government by the taxpayer. An indirect tax is paid to the government by an intermediary, who collects the tax from the taxpayer on behalf of the government. The VAT is an indirect tax levied on the consumption or use of goods and services. It is charged at each step of the supply process. The end consumers bear the costs of VAT while registered businesses collect and account for VAT, acting as tax collectors on behalf of the government. A manufacturer who produces plasma television sets sells a TV to a wholesaler for AED 1000. Under the new tax system, the manufacturer collects a VAT of 5% (AED 50) from the wholesaler on behalf of the government. The wholesaler then pays a total amount of AED 1050. The wholesaler increases the selling price to AED 2000 and sells it to a retailer. 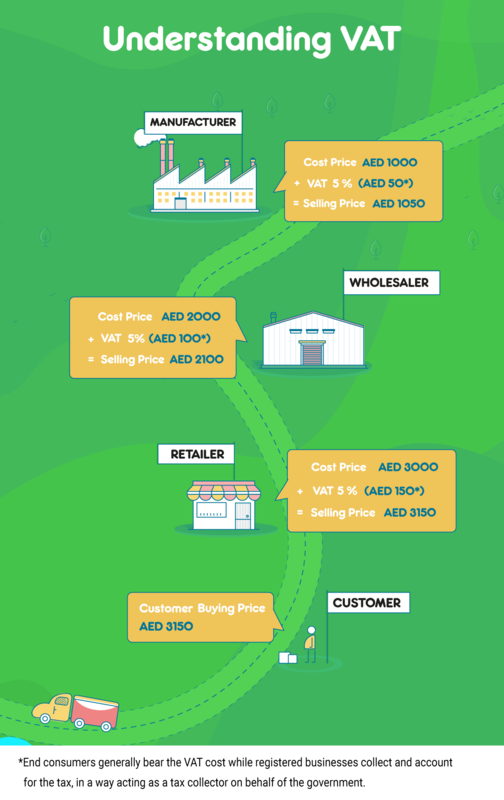 The wholesaler collects a VAT of 5% (AED 100) from the retailer on behalf of the government, while also receiving a refund of the VAT paid to the manufacturer in the previous step. The retailer pays a total amount of AED 2100. The retailer further increases the selling price to AED 3000 and sells it to the end customer. The retailer collects a VAT of 5% (AED 150) from the end customer, while also receiving a refund of the VAT paid to the wholesaler in the previous step. The end customer pays a total amount of AED 3150 for the plasma TV set. A value added tax is applied at every stage of the sales process, and the registered business receives a refund (or tax credit) on the VAT paid at the previous step. The Federal Tax Authority (FTA) has specified a fixed VAT rate of 5% for the sale of goods and services in the UAE. The UAE delivers excellent public services, including healthcare, education, public transportation, and social services. The introduction of a VAT will allow the government to diversify their sources of income and continue to ensure a good standard of living for UAE residents. The implementation of VAT is expected to generate AED 12bn of revenue in it’s first year and up to AED 20bn in the second year. Registration may be mandatory or voluntary, depending on the business revenues generated. A business must register for VAT if the total value of their taxable sales and imports within the UAE exceeds the mandatory registration threshold of AED 375,000 for the previous 12 months or within the upcoming 30 days. A business can voluntarily register for VAT if the total value of their taxable sales and imports within the UAE exceeds the voluntary registration threshold of AED 187,500 for the previous 12 months or within the upcoming 30 days. Startups and small scale businesses have the option of registering voluntarily if their expenses exceed the voluntary registration threshold, thereby making them eligible for tax credit. VAT will come into effect starting on January 1st, 2018. The electronic registration portal for VAT will be open from the fourth quarter of 2017 on the FTA website. Businesses can register online by logging in to the electronic registration portal starting from 1st October 2017. Certain education and healthcare supplies. Goods and services exported outside the GCC. Certain investment-grade precious metals (e.g. gold and silver of 99% purity). Newly constructed residential properties sold within 3 years of construction. 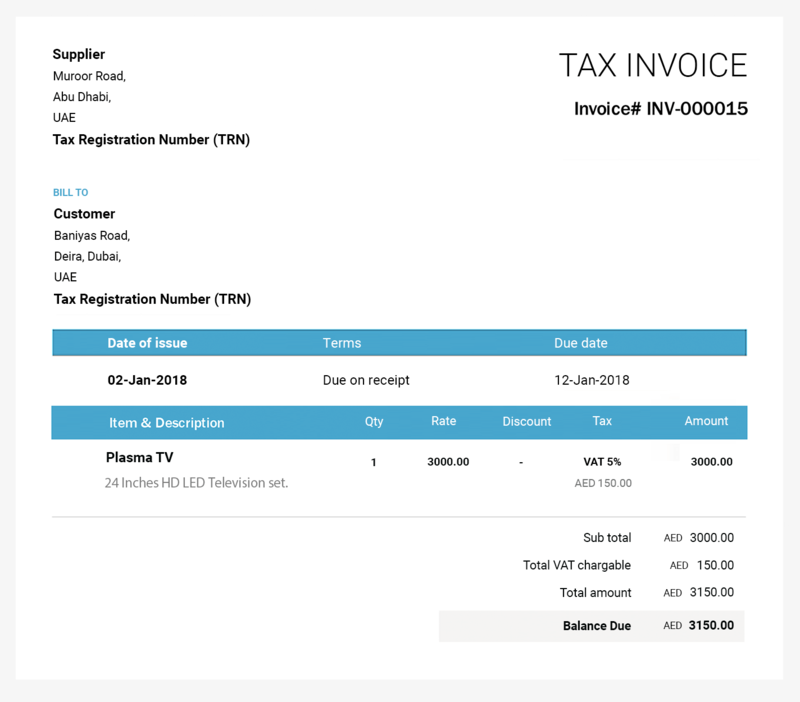 The supplier’s name, address and Tax Registration Number (TRN). The customer’s name, address and Tax Registration Number (TRN). Description of goods or services supplied. Price and quantity of each item. Rate of discount per item. Rate of VAT charged per item - if an item is exempt or zero-rated, then mention there is no VAT on these items. Credit notes are issued when products are returned for a refund, when an invoice amount has been overstated, or in other circumstances where the business must issue a refund to their customer. It is a document sent by a seller to a buyer notifying them that a credit has been made to their account against the goods returned by the buyer. Debit notes are issued when the amount payable by a buyer to a seller increases (due to extra goods delivered or goods already delivered charged incorrectly). These can be issued as a letter or formal document specifying future liability. Invoices that are issued once cannot be altered. Credit/debit notes are issued as explained above when there is a modification made to an existing transaction. Note: VAT registered businesses must maintain the specified bookkeeping records for at least 5 years from the date of transaction.